QUEENS — A hatchet-wielding man attacked a group of rookie police officers — striking one in the head and another in the arm — before being gunned down on a busy Jamaica shopping strip on Thursday afternoon, the NYPD and sources said. A female bystander was also shot and seriously wounded in the fray, police and witnesses said. The chaotic scene unfolded about 2 p.m. when a freelance photographer approached four officers assigned to foot patrol with the 103rd Precinct and asked to take their picture on Jamaica Avenue near 162nd Street, NYPD Commissioner Bill Bratton said during a Thursday evening press conference. As the officers posed for the shot on the rainy street, Zale Thompson, who was swinging an 18 1/2-inch metal hatchet, charged and struck Officer Joseph Meeker, 24, in the right arm, Bratton said. Thompson swung again, striking Officer Kenneth Healey, 25, in the back of the head, knocking him to the ground. Thompson never uttered a word and investigators have no motive for the attack, but police are investigating whether he was inspired by the radical Islamic State of Iraq and Syria and other militant Islamists, sources said. 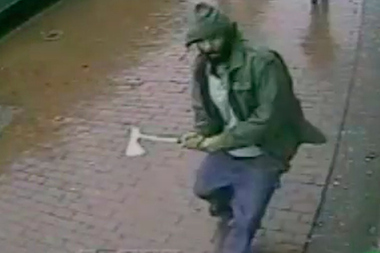 Surveillance video released by the NYPD shows Thompson, 33, a Queens resident, in a green raincoat with the hood up run up and swing at the officers with a two-handed grip on the hatchet. Two other officers shot and killed Thompson in front of the Conway department store. 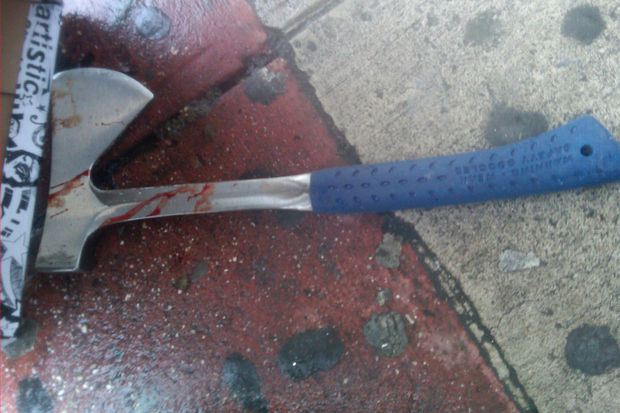 A hatchet was recovered at the scene, Bratton said. Healey, who has family members on the force, underwent surgery for two compound skull fractures in Jamaica Hospital Thursday night and was expected to survive. Meeker was expected to be released that night. "I was very impressed by not only the bravery in the face of something absolutely unexpected, but the way the two officers responded to the incident and were able to stop the situation and deal with the perpetrator," Mayor Bill de Blasio said at a press conference from the hospital. All four officers graduated from the Police Academy in July. The 29-year-old bystander was hit in the lower back as she crossed Jamaica Avenue half a block away, witnesses and police said. She was also taken to Jamaica Hospital in serious condition and was expected to survive, sources said. Witnesses near the scene said the woman cried out in pain after she was struck. "I saw her fall to the floor," cellphone store manager Shafique K. said. "She was saying, 'Oh, my kids. Oh, my kids. Are they going to be OK?'" He said he saw her bleeding from the abdomen and, despite his own queasiness, helped her call her family. "She was conscious. She even put her password on her phone," he said. "I called and a man answered. I told him and he said, 'I'm coming, I'm coming.'" Shafique K, who runs Call Me Wireless, said that in the chaos, none of the officers realized she was shot. "I was holding her hand and I was telling her that everything was going to be okay, the ambulance is coming," he said. "Police was running and nobody paid attention to her." The shooting, which happened in the heart of Jamaica's shopping district, shook up the local workers and shop owners. "We're a nervous wreck in here," medical assistant Ericka Babb, who works nearby, said. "Everybody's shaking. We don't know what's going on." The Queens District Attorney's office is also investigating the shooting. Additional reporting by Janon Fisher and Aidan Gardiner.